Volunteer railway builders are working every day to try to meet a deadline for the reopening of the Bluebell Railway extension to East Grinstead. 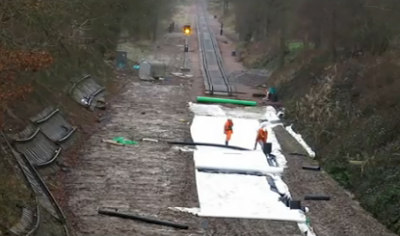 Gangs of up to 30 people are clearing the way and laying track for the final 100m through the Imberhorne cutting, south of the town.Snow, mud and water has slowed down their efforts but they are hoping to complete the line by mid-March. Volunteer Mike Hopps said the work was "in the final stages". "There has been a huge amount of material to get rid of," he said. "The last 50 to 100m needs to be levelled before we can start putting ballast down and laying track. 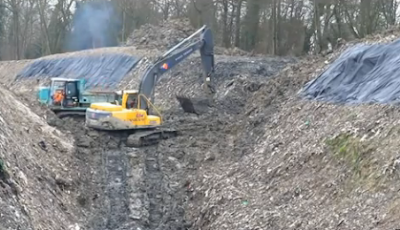 "Diggers on the top are profiling - they're bringing the edge of the cutting back to what it looked like in 1958, before it started to be filled by the local authority. "A lot of work has been done to try and make it look as original as possible." Nearly there, contractors dig out the last section between two new cuttings. Mr Hopps said although the recent heavy rainfall had caused the work to fall behind by three to four weeks, workers "were still rushing to get it finished on time". The railway currently runs for nine miles from Sheffield Park to Kingscote but the two mile northern extension will join it up with the national railway network. Work to extend the Bluebell Railway to allow steam trains to go to East Grinstead began more than three years ago. The official opening is due to take place on 23 March - 55 years after the original line closed. A special through train from London will run to mark the event.